1, Long press the switch key 3 seconds to turn on the light mode 1 light, while lullaby music 1 play. 2, Short press the switch key to replace the light mode. 3, If you only need to replace the hypnotic song, press the remote control or host to replace the Previous or Next song. 4, When inserting the TF card or external source, the lullaby automatically shut down. 5, When inserting the external sources, the host and remote control Previous or Next song can not been operated. 6, According to the remote control H1 / H2 / H4 that the host timer settings, in 1 hour / 2 hours / 4 hours after the automatic shutdown. 7, Press the remote control TIMER OFF button to cancel the timer function. 8, Long press the key to turn off. 4.This product is non-waterproof, prohibited storage or use in the place of humid or high temperature. 5.The way to adjust the angle : you need push the projection panel downward to change the angle, please notice that , it can be adjusted 45°. Newest Ocean Wave Projector: A New version here: 【http://a.co/bDBv6xu】With Remote controller & touch senor keys, dual-optional and more convenient for operation. Can be used to turn on/off the lamp, change lighting mode, adjust the volume, to set automatically turn off timer. 12LED &7Colors&45°angle : 12 super bright LED beads and 7 lighting modes, you can choose which mode show depending on your mood or the surrounding at ease. And the lamp can be tilted 45 degree, convenient for you to project the light straight up or point in an appointed direction. Built-in Mini Music Player: Equipped with TF card slot（TFcard not included）and built-in mini speaker, enjoy music, relaxing, meditation music while insert TF card or connect with external audio source. And there are four built-in music: forest insect sounds, ocean wave sea gulls sounds, flowing water birds sounds and merry nature sounds. Auto Off Timer:3 Auto off timer options- built-in 1H, 2H, 4H auto off timer, the lamp will automatically shut off after the preset time. And of course timer can be canceled to stay on all night long. [Wall charger included in the package] -The projection night light is powered by DC 5V USB input, you don't need to buy extral power adapter for it. 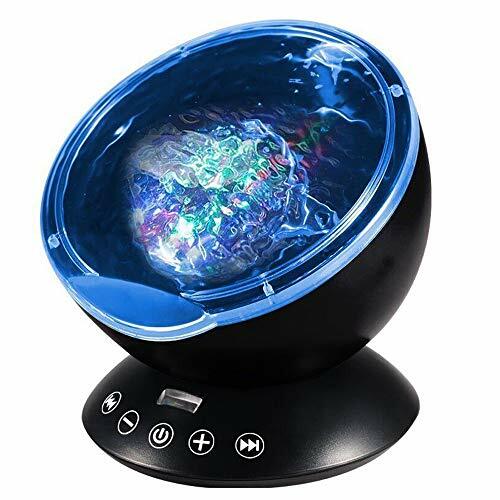 It's a color changing wave LED night light sleep sound machine with mini speaker powered by matched USB cable, power adapter and control by both touch sensor key and controller (2*AAA battery not included). It's perfect for creating a watery ocean atmosphere, which can be used in bathrooms, living rooms, baby rooms, parties, room decor or any other.